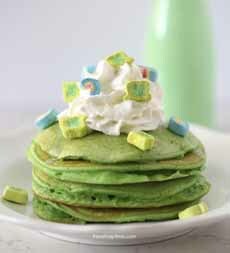 Green pancakes with optional Lucky Charms (photo courtesy I Heart Naptime). The marshmallows have been plucked from the cereal. 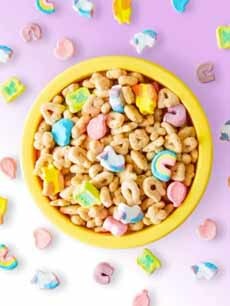 Lucky Charms cereal (photo courtesy General Mills). From Jamielyn of I Heart Naptime, Saint Patrick’s breakfast includes green pancakes with Lucky Charms, green milk (use food color) and rainbow fruit parfaits. Yes, there’s sugar; but it’s a special-occasion fun food—ready in 20 minutes. 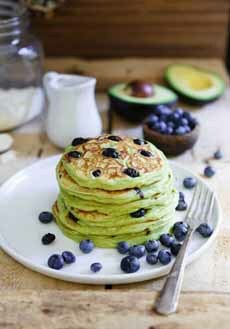 For those who don’t want the extra sugar, there’s a nutritious green pancake recipe below. 1. PREHEAT a griddle to 300°F. Combine the milk and vinegar in a small bowl. Set aside and let sit for a few minutes. 2. COMBINE the flour, sugar, baking soda, baking powder and salt in a large bowl. 3. WHISK the butter, egg and vanilla into the milk. Add the food coloring and stir until you reach the desired color. Then combine with flour mixture, and stir until smooth. 4. USE a 1/4 cup measure to pour the batter onto a greased griddle. Let cook on one side until bubbles begin to pop, then flip to the other side. Cook just until golden brown. Garnish as desired. California Avocados entices bloggers to try different, tasty things with their crop. This recipe for fluffy pancakes, from Running To The Kitchen, has healthful and nutritious avocado plus blueberries. For protein, they’re topped with a poached or fried egg for a combination of savory and sweet. They’re naturally green from the avocado, but you can add a drop of food color for a deeper hue. *Coconut oil does not have a coconut flavor. It can be substituted 1:1 for any other oil or solid fat (butter, vegetable shortening) without dramatically changing the flavor of the recipe. Blueberry-avocado pancakes from Running To The Kitchen. 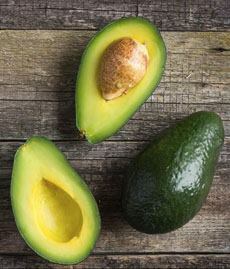 Avocados add their creamy texture and flavor to a variety of sweet foods, including ice cream (photo courtesy California Avocados). 1. WHISK together the flour, sugar, baking powder, salt and nutmeg in a medium bowl. 2. COMBINE the mashed avocado, milk, egg, coconut oil and vanilla in a food processor and process until smooth. 3. ADD the avocado mixture to the flour mixture and stir until just combined. 4. PLACE a bit of butter in a large skillet or griddle over medium heat. Once melted and hot, scoop the batter into the pan, dot each pancake with a small handful of blueberries, and cook for 2-3 minutes per side until golden brown. 5. DIVIDE the pancakes into two stacks and top each with a poached or fried egg.